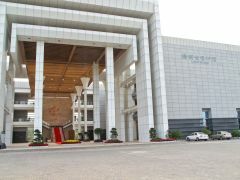 Hainan Provincial Museum was established in 1984 and removed to its present location in 2008. It is now at 68 Guoxing Avenue, Haikou City. It is in the Hainan Cultural Park, adjacent to the Provincial Library and Arts Centre. Construction started on the new building at the end of 2005. Opening hours are from 9am until 4pm, everyday except Monday. Bus 29, 33, 34, 43, 45 and 48 go to Guoxing avenue. The Museum is well worth a look. There is a lot to see here and you should allow plenty of time to look around. There are exhibits covering everything from prehistoric times up to the present day. The amenities are excellent.